On July 1, 1863 slavery was officially abolished in Suriname. A ten-year transitional period followed during which former slave owners received a monetary compensation for each former slave. Since many years people originally coming from Suriname celebrate in The Netherlands on July 1 the feast of Keti Koti, “The Breaking of the Chains”. It is only fitting that last week the digital version of slave registers kept between 1830 and 1863, now hold by the Nationaal Archief of Suriname (NAS) in Paramaribo, was launched by a number of institutions led by Coen van Galen at the Radboud Universiteit Nijmegen and Maurits Hassankhan at the Anton de Kom Universiteit van Suriname, with support from the Dutch National Archives in The Hague. Last year I reported here on the project to move a number of archival collections concerning the history of Suriname from the Dutch Nationaal Archief to the NAS, and to digitize also a number of these collections. Collections with relevancy to legal history figure large among them. The digitization of the slavery registers is a key element completing the efforts for digital access and conservation, indexing the registers and making them much more accessible for researchers and the general public worldwide. In this post I will look at these registers and their online presence. In January 2017 the project for indexation and digitization of these slavery registers started, just after the transfer of important archival collections from The Hague to Paramaribo. A campaign with the slogan Maak de Surinaamse slavenregister openbaar, “Make the Surinam slavery registers public”, proved effective. Some 600 people donated money for the project, and some 400 volunteers helped indexing the registers. To put the record straight, anyone could and can come to these archives to gain access to the original volumes, provided their material state is not too fragile. It is safe to assume that you need to come with good arguments to touch them now they can be consulted online. The Dutch National Archives did already provide public access. The operation to bring archival collections back to Suriname created a more urgent need for conservation and digitization. The digitized registers now in Paramaribo [NAS, toegang (finding aid) 16, inv.nrs. 1-43] can be accessed using an index form shown above. On purpose the NAS has not placed these registers among its forty digitized archival collections. The Dutch National Archives provide also online access to the slavery registers among its ever-growing set of online indexes. You can download the index in its entirety (4,2 MB, zipped file). At this point something becomes clear when you look at the URL of this file, a web address in The Netherlands at the search portal Ga het NA of the Nationaal Archief in The Hague. The search form of this digital resource at both archives is almost, but not completely identical. You can use either a simple search form (Eenvoudig zoeken) with three fields, one for a free text search and two fields for setting a period, or go to Uitgebreid (Advanced search) with more fields. In the second mode there are additional fields from the slave name, the name of the mother, and the name of the slave owner. You can click on the search results in order to get both the information on a person, including also gender, references to the registers and the type of register – with its inventory and page number – and an image of the page in question. It is possible to zoom in at will to any image. Each scan has an individual URL, a URL from my country when viewing individual results, meaning there is one single database behind the two versions. By clicking on the field name in the results you can change their order. You will find either the names of owners or the name of the plantation and its location. It is not my purpose to single out here any defects and omissions, but a few things are very visible. First of all the version hosted in The Hague contains additional information which is not or not yet provided at the website of the NAS. The section Achtergrond (Background) informs you about the information given in the search fields, with a second page about slavery in Suriname and the introduction of slavery registers and their survival. There are important losses, not in the least some registers of slaves owned by the Dutch colonial government. In the registers mutations such as birth and death, acquisitions and sales should be written down. A third page on Gebruik (Use) contains instruction on the use of the indexes and the interpretation of results, and also a handy list of common abbreviations in the registers. The other pages contain a colophon about the project and the user license (CC-BY-SA 3.0 NL). A second thing to note is the incomplete translations in the English version of the search form. Even the simple search form has not yet been translated completely. The field names in the results screen have not been translated. A much sillier thing becomes also visible: In cases where there is no gender information, the volunteers entered the word Leeg (Empty). I suppose there are more concise and effective ways to convey the fact that no data have been entered in a particular field. Using to a large extent at this moment only Dutch for this project is not a particular lucky thing, and you can even extend this to the project website. Translations in languages such as English and Sranantongo are not just welcome, they are simply needed to really open this resource to people worldwide with interest in Caribbean history, the history of slavery or Dutch colonial history. For any project on Dutch colonial history in the East Indies contemplating translations into English and/or Bahasa Indonesia is luckily a natural thing. The project team states flatly these registers are a worldwide unique resource, the only series of its kind. On the project website some further, rather important explanations about the actual state of the slavery registers are offered. It appears no general index to the series existed. Some registers could be consulted on microfiches, but without one or more indexes searching would mean wandering in a jungle without much hope for any results. The thing to note here is that only in 2017 the need for an index was perceived as sufficiently urgent to start a project to deal with this sorry situation. Earlier on having only severely hampered access seems not to have led to constructive action. Van Galen and Hassankhan rightly stress the importance of the slavery registers for not only genealogical research, but as a key resource to connect with the manumission registers, neighbourhood registers of the city Paramaribo and other sources for Suriname’s history during the nineteenth century. The historic context and the slavery registers can enrich the information contained in them in both directions. Surely we need to thank Coen van Galen and Maurits Hassankhan and the army of volunteers who succeeded in getting their tasks completed in time. Van Galen and Hassankhan provide on the project website a very useful page with four PDF’s with information that should immediately be included on the websites of both versions of the online index. 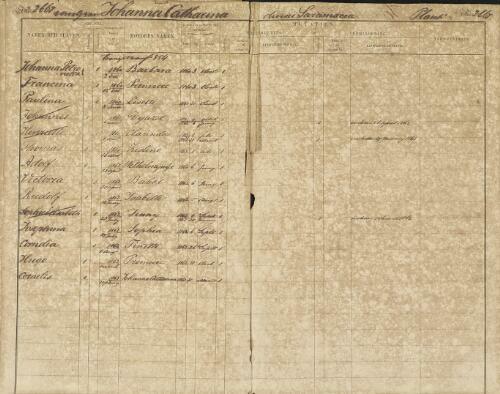 The project leaders provide a list with the names of plantations and other Dutch posts in 1834 (530 kB), a list with the names of free people in Paramaribo in 1846 (2,2 MB), both created by Huub van Helvoort, a list with first names of enslaved people on a number of plantations (70 kB), and even a list of letter forms, letter combinations and some Dutch words in nineteenth-century Dutch script (650 kB). It is good to see some basic historical skills are not forgotten! However, to my disbelief I did not find on the project website the URL of the index, not even after a few days… The slogan Open the slavery registers seems to have been at least temporarily forgotten by the web team. More down to earth, the current summer heat in my country, the gulf of enthusiasm about the launch, and the very end of the academic year created perfect excuses for forgetting to open literally the doors to the final results of the project also at the project website. The absence of news items from June and July 2018 is another indication for the sleeping state of the project website. Such omissions and minor problems can be fixed quickly. I would urge anyone involved with this project to proceed as soon as possible with distributing lacking information to both versions and completing the translations. This succesful project well deserves this last effort to remove the barriers and chains which hindered easy access and practical use. The slavery registers of Suriname deserve interest from many corners. The uniqueness of these slave registers should be considered in the light of the presence of similar registers held at the Nationaal Archief Curaçao (finding aid 005, Archief Koloniale Overheid, nos. 1-1070). This entry was posted in Archives, Digital projects and tagged Caribbean, Colonial history, Crowdsourcing, Digital archives, Latin America, Legal history, Netherlands, Open access, Palaeography, Slavery, Suriname on July 6, 2018 by rechtsgeschiedenis. How to deal with major questions, problems and conflicts in history? How should one write about them as a blogger? Subjects such as the abuse of power, law and justice, the undeniable role of violence, wars, the exclusion of people from society, and the outright systematic persecution of people for whatever reason, cry out for probing questions and research from many perspectives. Here I have promised several times not to avoid such themes and problems. One of the reasons that my first posting of 2013 occurs only late in January is exactly devoting time to one of the subjects which cannot be excluded from legal history. In my country the abolition of slavery in Suriname in 1863 will be commemorated. In this post I will look at some publications and websites dealing both with slavery as a general subject and with the history and aftermath of slavery in Suriname. Until 1975 Suriname, situated between British and French Guyana, was a Dutch colony. I will not aim at any kind of exhaustive treatment of the abolition of slavery in this country. The commemoration of the abolition of slavery in Suriname in the year 1863 has thus far in particular received attention on Dutch television in the NTR-VPRO series De slavernij [Slavery] broadcasted in 2011. The series centered around the search of the Dutch singer Roué Verveer for his ancestry. The very fact that background information was presented by a well-known Dutch anchorwoman was criticized by some people complaining she figured as a kind of all-knowing presenter high above the black singer who seemed only to ask questions which he could not answer himself. Whatever the value of this critique, in the book accompanying the series, De slavernij. Mensenhandel van de koloniale tijd tot nu [Slavery. Human traffic from colonial times until the present] (Amsterdam 2011) edited by Carla Boos and a team of scholars, his quest for the history of his family is barely touched upon. The website of the series presents a very well equipped nutshell guide to genealogical research for Surinam ancestors. In fact it is a model of its kind, and I have searched in vain for a similar comprehensive treatment of the subject at other websites. Surely, the Dutch Nationaal Archief offers a guide to its own online databases concerning slavery in Suriname, even in English. It is one thing to have access to digitized manumission and emancipation registers, but knowing how to use them is a prerequisite dealt with very clearly at the TV series website. A possible complaint about the website is much more a request, the need for translation of the Dutch version into English and Papiamento. The book by Carla Boos offers a very readable and lavishly illustrated introduction to the history of slavery in general, the slave trade in Africa, the Dutch Atlantic slave trade, slavery in Suriname and its living memory. The choice of documents written by all kind of people to tell stories from inside is excellent. The only things missing are a good overview of the images, and registers for subjects and names. On a website for Dutch history on television and radio you can find several earlier items in a dossier on slavery, for example on the slave trade between Vlissingen (Flushing) in Zeeland, the Dutch fortress Elmina in Ghana, and Tobago in the Caribbean. Some digitized books about the history of Suriname can be found in the project Early Dutch Books Online (EDBO) which focuses on the period 1780-1800. In its digital collection Suriname 1599-1975 the library of the University of Amsterdam has digitized several old maps of Suriname and a small number of books, including the Dutch translation of Johan Gabriel Stedman’s book about his travels. You can also view an abridged version of this translation on a separate website – using Shockwave – but you can use more easily the complete version at EDBO. In the Digital Library for Dutch Literature you can find not only novels concerning Suriname and books in Dutch by authors from Suriname, but also the text of several editions of the Surinaamsche Almanak from 1820 onwards. This yearbook contains for example lists of plantations, their locations, owners and administrators. Documentation about the sea voyages made by slaves and their traders can be found in particular in the online database concerning the Trans-Atlantic slave trade of Emory University. The activities for this year’s commemoration of the abolition of slavery can be followed most easily using the website of the NinSee in Amsterdam, the Dutch central institute for the study of the Dutch slavery past and heritage. The NinSee publishes studies and source editions in its own publication series. However, in my opinion it is a failure this website offers its information only in Dutch. If I have learned just one thing from the 2011 tv series it is exactly you cannot isolate the history of slavery from general history. The selection of scholarly literature about Dutch and Atlantic slavery on the website does redress this imbalance a bit. The NinSee institute is housed almost next door to the municipal archive of Amsterdam. Digitized old maps of Suriname are abundantly present on the website of the Dutch Royal Tropical Institute. At the Memory of the Netherlands portal for digitized collections concerning the Dutch cultural heritage you will find many thousand digitized objects related to Suriname from a number of Dutch collections. Among them are apart from the Royal Tropical Institute the Tropical Museum in Amsterdam – its main website can be viewed in seven languages, and the collection can be searched at a separate subdomain – and the Royal Netherlands Institute of South East Asian and Caribbean Studies in Leiden, with its own digital image library. Six Dutch ethnological museums work together for a portal website where you can search their collections, but you can still search online separately in the collections of the Museum voor Volkenkunde in Leiden or its library catalogue. Perhaps it is wise to mention here also the project Caribisch Erfgoed [Caribbean Heritage] for the digitization of photographs taken between 1886 and 1970 by the Brothers of Tilburg, a Catholic educational congregation long active in Suriname. At the start of a commemoration year leading up to the first of July, the very day on which in 1863 the abolition of slavery in Suriname was formally proclaimed, it becomes increasingly clear for me how important it is to view this history from many perspectives. While reading about Suriname I had also on my desk Eric Foner’s The Fiery Trial. Abraham Lincoln and American Slavery (2011). Last year I wrote a post about the Athenian democracy, and I am sure I will learn more about it when taking the role of slavery in ancient Greece into account. Learning about slavery also sheds light on the practice of commemorations in contemporary society. One of the commemorations I will surely write about here in 2013 is the bicentenary of the Kingdom of the Netherlands. At the website of the Stichting Oud-Vaderlands Recht, the Foundation for the History of Old Dutch Law, Dutch readers can find an overview of exhibitions, symposia, recent publications and websites concerning Suriname and slavery. One of the most salient new digital projects is an interactive map of the houses of slaveholders in Amsterdam in 1863 created by Dienke Hondius and her history students at the Vrije Universiteit Amsterdam. This entry was posted in Peoples and tagged Africa, Caribbean, Colonial history, Legal history, Netherlands, Slavery, Suriname on January 29, 2013 by rechtsgeschiedenis.